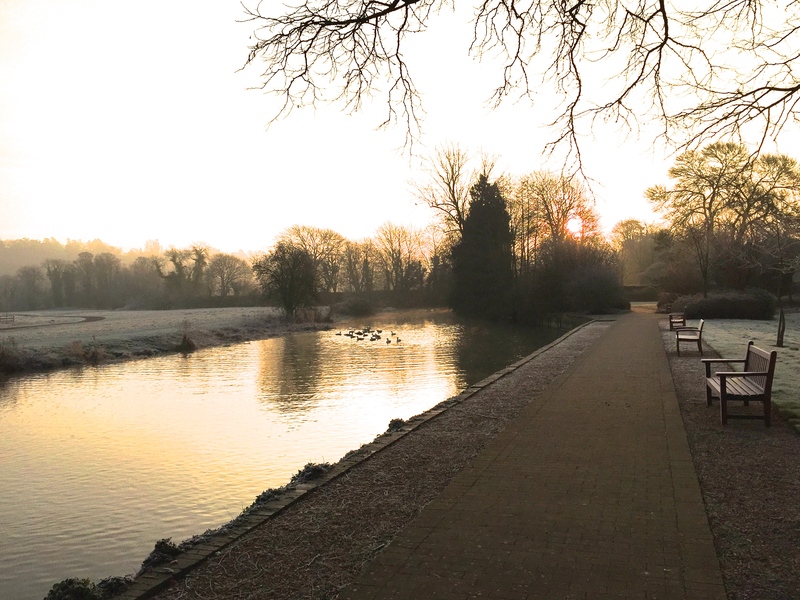 Last week Jack Frost paid the South East a visit, spreading his icy fingers over fields, woods and gardens. The scenes at sunrise were breathtaking, a great satsuma of a sun illuminating layer after layer of petrified countryside. I was lucky enough to be out and about in Berkshire on one of those magical mornings, watching the day dawn over the River Thames. A gaggle of Canada geese joined me, hopeful of a free breakfast. It’s been a while since I last set foot on grass so frozen that it crunched under foot. Where worm casts had appeared they were transformed into toe-stubbing doorstops of earth. 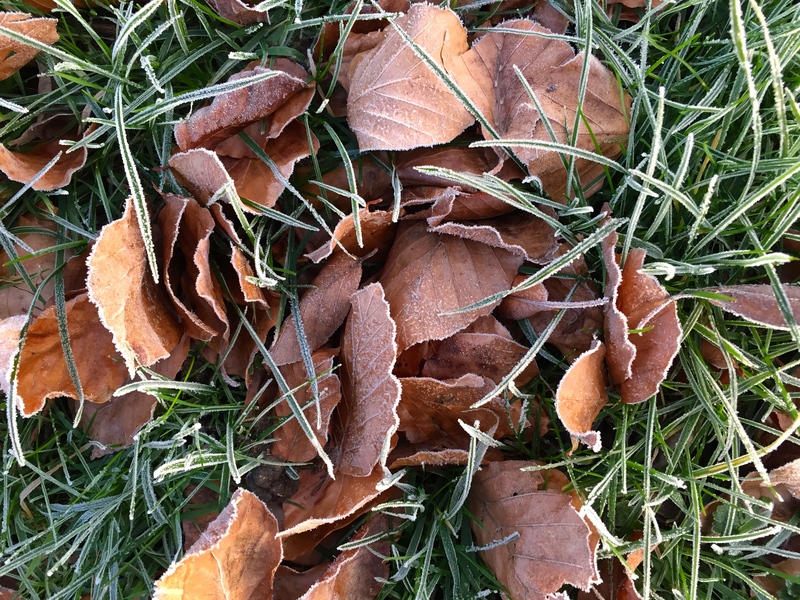 Crisp beech leaves, always so persistent, littered the frozen sward. Every dessicated leaf was fringed with fragile ice crystals. 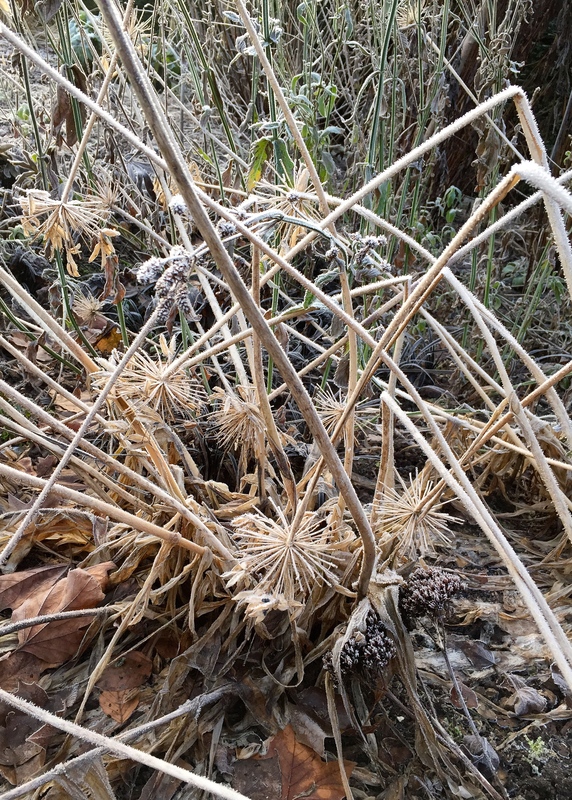 Faded herbaceous perennials, left in situ for days like these, formed a Jurassic forest of twisted and broken stems, each densely felted with ice crystals. Birds darted low and fast between the crippled plants, fervently seeking food and shelter. 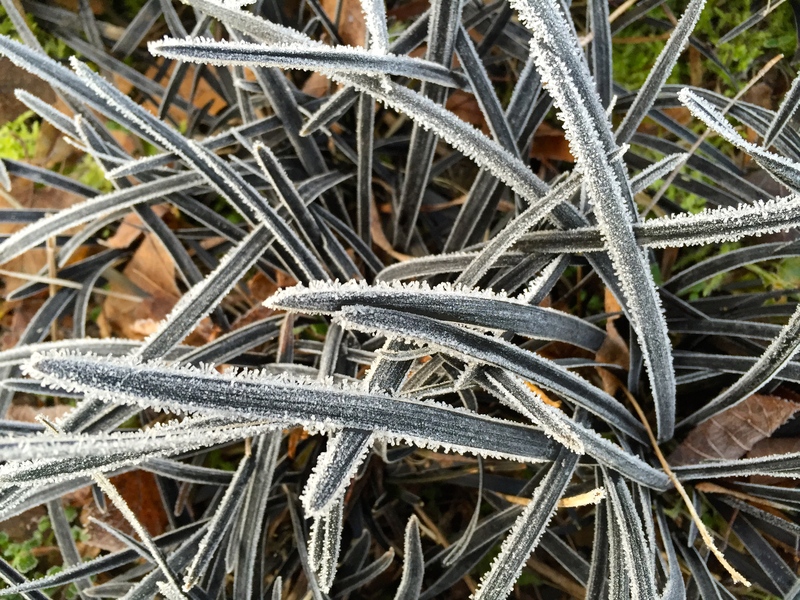 The star of the shiver-inducing show was diminutive Ophiopogon planiscapus ‘Nigrescens’ (otherwise known as Lilyturf), prized for its strappy black leaves but surely never more striking than when encrusted with feathery ice crystals? Thankfully Mr Frost has given both our gardens a wide berth this winter, but how long we’ll escape his icy grip, nobody knows. What beautiful pictures and an added anticipation for springtime weather. Gorgeous! Beautiful words and photos, Dan. Although I have to say, non-frosty mornings aside, I am never quite sure about black plants – is it just me? Used appropriately and skillfully I think black foliage can really work (I would not be without Aeonium ‘Zwartkop’ for example), but too often they are billed and employed in a novelty capacity. This does them a disservice. The other issue is that without brighter foliage around them they tend to dissappear, so by association they come across as a bit crass. Thankfully we have so many plants to choose from we can avoid the ones that dont float our boat! Something fairytale about a frosty morning. I recently learned there’s a difference between frost and frozen dew which I just found fascinating. Frost is formed at ‘frostpoint’ when moisture in the air goes from gas to solid and dew is formed at ‘dewpoint’ when moisture in the air goes from gas to liquid, then it might freeze to a solid if it’s cold enough and become frozen dew. You can tell the difference because frost is feathery looking with crystal formations like in your pictures. I didn’t know about rime – another new thing, thanks! Goodness. Wrap up warm Judy! Hi David. More by luck than judgement we have managed to create a very protective microclimate in our seaside garden. Several times last week the car, which was parked just beyond the garden gate, was covered in frost, but there was not an ice-crystal in the garden. The secret is lots of trees, but the drawback is declining sunlight in such a confined space. I guess we can’t have it all! I have ‘Zwartkop’ in my garden, too – somehow this doesn’t feel black to me. But of course, Dan is right, is it how you use a plant that makes all the difference. Equally, I change my mind all the time too – it is what keeps it all interesting! I wouldn’t be without Ophiopogon, it works so well as a contrast plant with so many things. Snowdrops, the lime green foliage of sarcococca, dogwood stems, zingy eranthis.. and that’s just in winter. I have it under-planting a coppery coloured rose in summer and it’s stunning there too.